I found myself in Austin’s North Lamar Central Market a few days ago, and as always, I had to peek at the tea aisle. This particular store has a tea bar where you can bag your own amount of some popular brands, and there were several half ounce samples of each ready to go. I noticed that, this time, at least three of them were rose-infused teas. 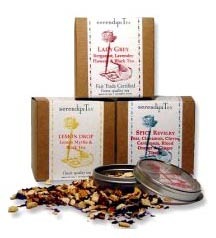 What a perfect gift idea for Valentine’s Day for any tea lover! I grabbed a sample of all three blends and tried them the very next day. 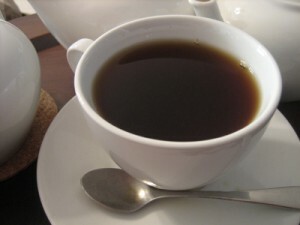 Since I bought samples without any suggestions as to brewing and steeping times, I chose to use 2 level teaspoons of each for my little two-cup teapot and a brew time of 2.5 minutes with fresh boiling water. I should have looked this one up earlier, because they also suggest using 1 tablespoon per 8 ounces of water heated to 190°F and steeping for 4 minutes. While I didn’t follow these directions, I was still delighted with the results. The scent was heavenly, but not overpowering. The taste was mild an pleasant with none of the bitter or sour than can sometimes come with a less-than-perfect green tea. This medium-bodied tea brought visions of Valentines day while I was drinking it. Highly recommended. 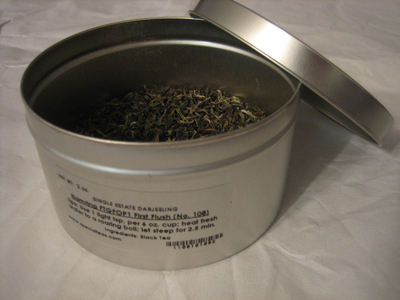 Again, the website for this tea had a recommended preparation (one level teaspoon per cup, water heated to just before boiling and a steep time of three minutes). 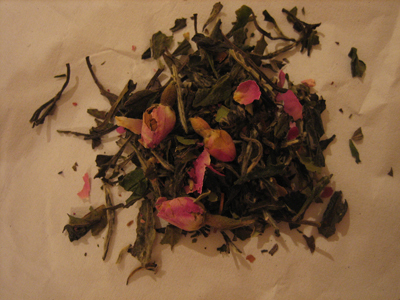 Green tea with a gorgeous blend of jasmine petals, laurel, lemon myrtle and rose buds and petals, this tea could be mistaken for potpourri (photo at right). But we’d rather brew it for its delicately sweet flavors and floral aroma. Inspired by a poem by Johann van Goethe (pronounced ger-te), the great 18th-century German poet who made important discoveries in connection with plant life, this fragrant tea is romantic as well as beautiful and tasty. 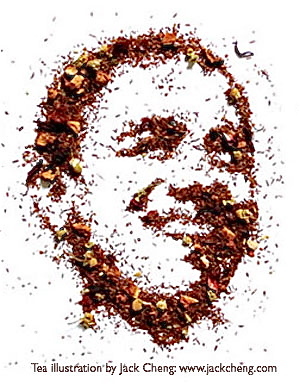 I have to agree that the tea leaves make a wonderful potpourri. The scent is heavenly, but not overly perfumed like some potpourris can be. But as a tea? Oy. Mine brewed up a lovely medium-dark color but with a strong rather department-store-perfume-counter scent that I found unappealing. And the taste? Well, the taste in addition to the scent made me think of furniture polish. I definitely didn’t like this one. 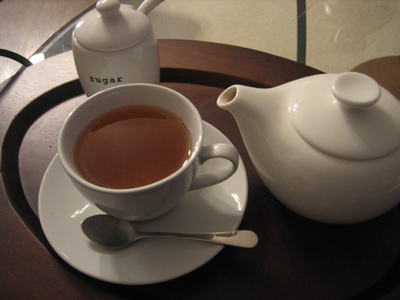 In fact, I couldn’t even finish the cup; I poured it back into the teapot. 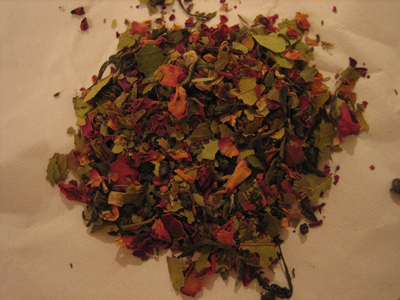 I may have been lucky to get any of this tea, as it’s out of stock on the Teance site and I was unable to find it anywhere else online (at the time I wrote this review). This cup on one turned out very dark, and I fully expected a rather bitter taste. I was pleasantly surprised. I couldn’t detect much in the way of perfume (but by this time Central Texas was under the assault of some serious cedar pollen and I was probably not smelling anything anymore). The taste was a typical black tea but with a floral finish and no bitter tannins. It certainly wasn’t as fabulous as the Rishi tea, but definitely drinkable. I might try this one again, but with milk. In the end, it was the Rishi blend that blew me away. Lovely, tasty and romantic looking to boot. I’d reccomend the Rishi’s White Tea Rose Mélange to anyone looking for a tea for Valentine’s Day. And if you’re looking to create your own rose-infused tea blend, you might might consider simply adding some organic rose buds to your favorite tea. 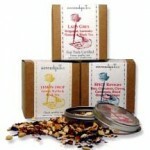 The English Tea Store carries organic rosebuds, perfect for adding to your own tea. I could spend all day with my nose stuck in this custom blend from Phonecia’s Mediterranean grocery store. The scent is just heavenly. 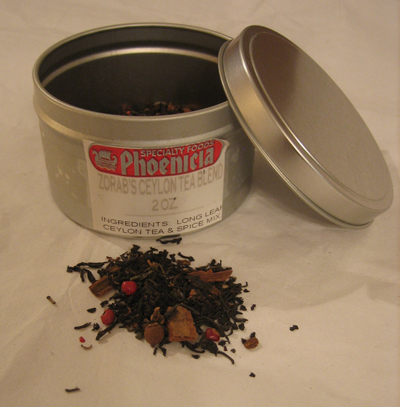 Zorba’s Ceylon Tea Blend includes ceylon (black) tea and spices (allspice, red peppercorns, cinnamon bark). There were no suggestion as to brewing time, so I chose to bring water to a full roiling boil, then steep 2 level teaspoons for my teapot for 2 minutes. 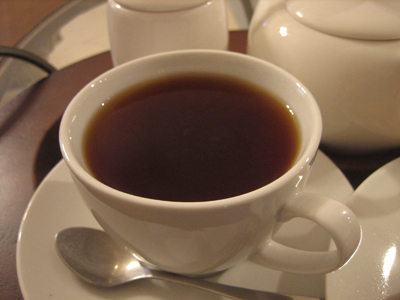 The brewed tea turned out a lovely, dark shade. 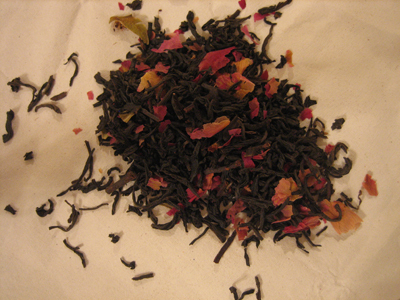 Even though this tea has a very rich and spicy scent, the actual brewed tea was quite a bit milder than I expected. Very light-bodied, the flavor was very subtle, with the cinnamon and allspice at the fore and nothing bitter at all. 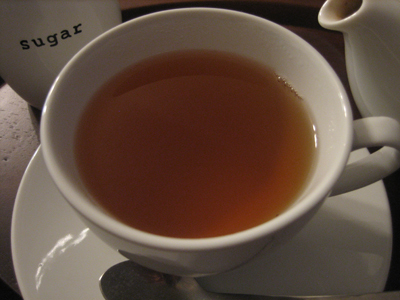 I think this worked best with quite a bit of milk and sugar – it felt almost like a chai tea then. 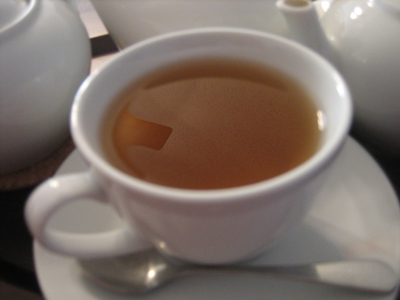 I wouldn’t recommend a second or third steeping though – I could barely taste the flavor of the tea by then. 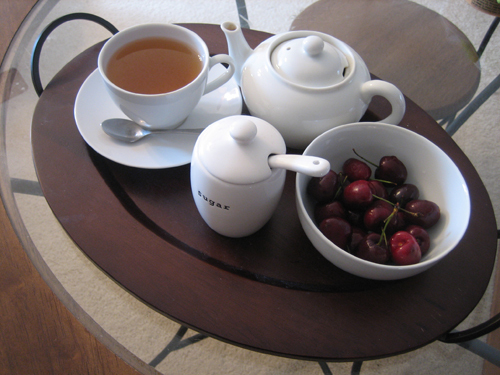 This would be a lovely tea for those days when you’re just not feeling your best. The scent and lightly spiced flavor are very comforting. 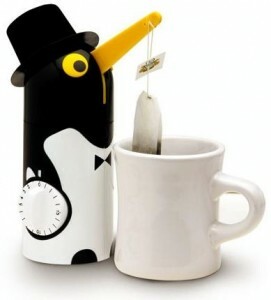 Unfortunately it appears I’m too late to get the version with the cute little top hat. According to an archived post at DVICE and Popgadget these were available from Signals back in October of 2007. They’re still available from Amazon.com, but without the hat. Rats. It’s just what my Linux-loving, geeky heart desires. And he really looks spiffy in the hat. The tea brewer features a unique, patented filter system and a drip-free spout with flip-top lid that snaps open automatically for easy pouring. 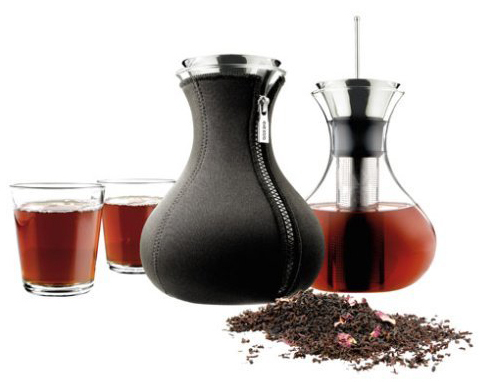 Insulated, zippered cover keeps tea hot. Unfortunately, it’s pricey ($140) and most of the reviews I’ve seen of this item have been fairly negative. Apparently the mechanism for stopping the brewing process doesn’t work as it should. That’s too bad, because the design is lovely, and I’d be tempted to add it to my collection, even if I didn’t use it much. Saudi Arabia has its oil. South Africa has its diamonds. And here in China’s temperate southwest, prosperity has come from the scrubby green tea trees that blanket the mountains of fabled Menghai County. Over the past decade, as the nation went wild for the region’s brand of tea, known as Pu’er, farmers bought minivans, manufacturers became millionaires and Chinese citizens plowed their savings into black bricks of compacted Pu’er. 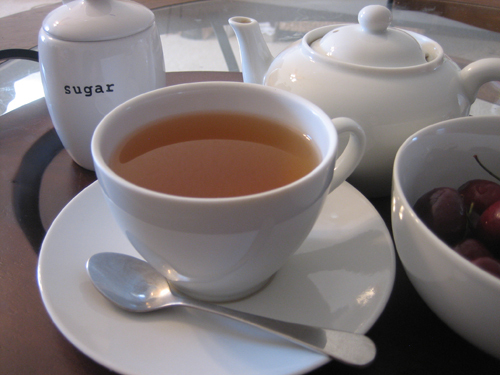 At least a third of the 3,000 tea manufacturers and merchants have called it quits in recent months. Farmers have begun replacing newly planted tea trees with more nourishing — and now, more lucrative — staples like corn and rice. Here in Menghai, the newly opened six-story emporium built to house hundreds of buyers and bundlers is a very lonely place. Among those most bruised by the crash are the farmers of Menghai County. Many had never experienced the kind of prosperity common in China’s cities. Villagers built two-story brick homes, equipped them with televisions and refrigerators and sent their children to schools in the district capital. Flush with cash, scores of elderly residents made their first trips to Beijing. Last week, dozens of vibrantly dressed women from Xinlu sat on the side of the highway hawking their excess tea. There were few takers. 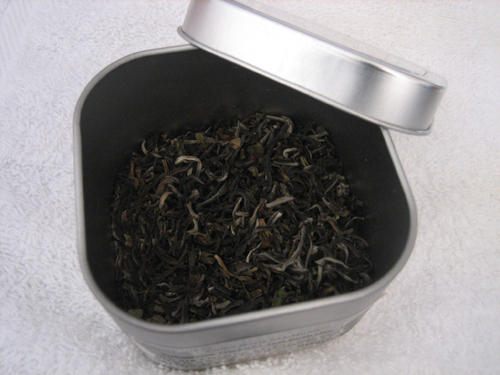 The going rate, about $3 a pound for medium-grade Pu’er, was less than a tenth of the peak price. The women said that during the boom years, tea traders from Guangdong Province would come to their village and buy up everyone’s harvest. But last year, they simply stopped showing up. 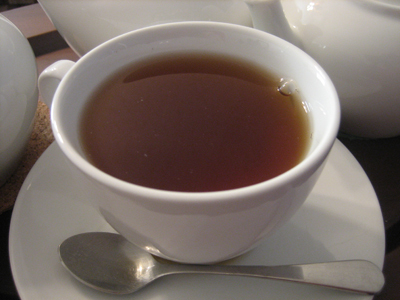 Read more about Pu-erh tea at Wikipedia. I’ve never tried Pu’er, to be honest. I’m not sure if I’d like it, given that I don’t care much for the taste of the slightly fermented Japanese teas that I have. But stay tuned. I’ll post about a tasting, if I can get my hands on some. It’s perhaps interesting to note that every review I’ve read so far of this concept design (it’s not available to buy) remarks that it is indeed pretty, but useless. 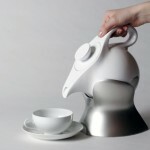 Who would be so lazy that they would not need to lift a teapot? Well, maybe not lazy. Having spent a decade-and-a-half advocating for accessible web design, I can right away see a practical use for those who love their tea, but suffer from arthritis, or the grip weakness that comes with advanced age. There were a couple of times recently when I had trouble lifting a medium-sized teapot (filled with boiling hot water no less) safely – even with two hands – because of the osteoarthritis in my right hand. I hope this concept design see actual production, and finds its niche in accessible design. 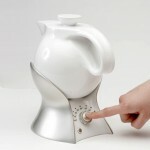 Comments Off on Accessible Tea Pot Design?